Paris is in a great location for weekend trips or even day trip to other areas of France. Flights on budget airlines such as Easyjet or Ryanair can you around Europe for a cheap price. The key to finding these budget friendly options is booking in advance and not waiting until the last minute. The TGV is another great option for traveling throughout France or to neighboring countries. So you’re abroad, and if you’re anything like me or other kindred spirits that flock to Europe for a semester, you want to see and do as much as you can. You have bucket lists to follow, goals to meet, and oh so little time! I get it. But if you’re anything like me–a planner, a like-to-knower, a maximizer–perhaps the whole abstract idea of “travel” can actually seem a bit daunting. In Barcelona, there is never a shortage of things to do and see. I am convinced it is impossible to be bored in this incredible city. As a music major living in Music City (aka Nashville, TN), music has been at the forefront of most of my college experiences. While other students were off at frat parties on the weekends, students at my school were going to “house shows,” which are essentially parties with live music, mainly made up of student bands and artists. Before your time in your new home comes to an end, SAI wants to give you the opportunity to look back on all the amazing photos you have taken by holding a photo contest! By entering, you will be eligible to win a $100 Amazon gift card just by sharing your photo with the SAI Instagram community. SAI Paris student Giavanna provides some photos of her recent museum visit in Paris. Having visited much of Italy previously, I had some idea what to expect on my long weekend trip to Milan. Still, Milan managed to surprise me. 1. The way people dress may surprise you Like Paris, my host city, Milan has a reputation has a high-fashion capitol. However, also like Paris, this is not necessarily evident in the looks you will see on the street. Barcelona is truly one of the most unbelievable cities in the world. Before I decided to study abroad in Barcelona, Spain, I knew very little about how much the city itself has so much to offer. As I have learned, the city itself offers a wide range of views from beaches to mountains to infamous churches to beautiful architecture. When I first decided to study abroad I knew I wanted to do one thing, travel. Isn’t that everyone’s main goal? To go as many places as you can in the three or four months that you are there, and not go into hundreds of dollars of debt. When I arrived in Rome, I was pleasantly surprised that that was the main goal of all my roommates as well. 1. Come Prepared One of the biggest pieces of advice I can give is to come prepared. Make sure you call your bank as soon as you know you’re studying abroad and order euros! This is typically the most affordable way to change currency. The most expensive way is in the airport through a currency exchange office, but it’s also really convenient. You have arrived in your host city and are ready to plan some weekend travel; now what? Use these guidelines to experience trips you will never want to end! One of the most important parts of planning a trip, outside of booking a flight or a train ride, is finding a place to stay. Plenty of people immediately count out hostels as an option, but there are some important factors to consider. When I first arrived in Paris for my fall semester, I remember my roommate telling me how she had heard of Reverse-Culture Shock: Essentially, returning home was a more difficult adjustment than coming here. I couldn’t really fathom it – how could returning home to the place I had always been be so difficult? We caught up with SAI Barcelona team members Leticia, Ashley and Sandrine, who provide some ideas on immersing yourself into the local scene. Being a team who is always looking for that off the beaten path adventure, from our personal experience, in order to get the true flavor of Barcelona, the best way is to get involved in the community. The number of museums in Paris that pop up after doing a simple Google search can be overwhelming. Luckily as a student studying abroad I have ample time to see many of these museums, from the must see to the lesser known. The most infamous and popular museum in Paris, and perhaps the world, is the Louvre. The key to successfully and enjoyably visiting this extensive museum is going when tourists are low in numbers. Eating out in Italy is nothing like it is in the States. There are many expectations around eating out that we’ve grown up with at home, but those all need to disappear once you move across the ocean, especially if you’re moving to Italy. Italians don’t eat to live; they live to eat. One of the first, and main differences that you’ll notice when eating out in Italy is the service. If I were to describe myself, “foodie” would certainly be at the top of the list. I really enjoy good food. Growing up, my parents instilled in me a passion for cooking quality homemade meals and indulging in fine dining. My mom’s life motto which has resonated with me is, “While many people will eat to live, I live to eat. I followed directions from a lot of strangers, got in a van, and was dropped off with a key from the 1800’s. So, the adventure started with me boarding a flight from Minneapolis to Atlanta and then on to Rome. All my flights went really well! My final flight was actually filled with students all going to Rome for the semester. We caught up with SAI Ambassador Yael, who took time to answer some questions about her semester in the Eternal City. What is your favorite memory from studying abroad? While I had many favorite memories and moments from studying abroad, one of my favorites is the traveling I was able to do. I have always had a travel bug within me and being abroad let that spirit roam free. We have two annual staff gatherings: a summer barbecue in August and a fabulous holiday party each December. 2. There are fourteen of us in the U.S office, plus many more working remotely in the U.S. We also have a lot of SAI staff working in our onsite offices in Rome, Florence, Milan, Sorrento, Siena, Paris & Barcelona. 3. We have two furry, regular office “mascots:” Gaia and Patty. 4. My name is Peter and I am currently completing an internship position at MedinAction. I secured this position through a connection via John Cabot University’s Center for Career Services. MedinAction is an on-demand, English-speaking medical service that delivers a qualified doctor to your home, office, or hotel. The service is available seven days a week, 24 hours a day. You can book your licensed physician online, by phone, or the app. This month we are highlighting a wonderful entry from the blog on GoOverseas.com. We find this article so relevant to study abroad students who are just returning from their host countries. Getting your thoughts together after studying abroad can be a challenge. Mentally, you may still be back on the beaches of southern France, or sitting on an Argentinean balcony with a Spanish novel in your hand. SAI took a moment to chat with SAI’s Director of Strategic Initiatives Rodney Harris, who shares some wisdom on studying abroad. Indulge me if you will as a previously young person who would like to pass on a bit of wisdom in regard to international education. As you may suspect, you are going to meet many people in your life. As the SAI Vice President of Enrollment Services I am bestowed with the honor of guiding students in finding the perfect program in the perfect location. I get to listen to student’s fears, goals, wishes and dreams. And I get to answer lots of questions, which I truly love. SAI caught up with SAI Assistant Admissions Counselor Amanda Roscoe, who provides some helpful options for budget-friendly travel in Europe. Living in Europe as an American brings a lot of unexpected surprises. Try finding an open pharmacy, bank, or grocery store on a Sunday, for example. The Europeans tend to take leisure a lot more seriously than we do in the States. Vacation and time spent with family are very important. Upon first exploring Rome, I was very much a tourist with tunnel vision, having only a few key things I knew I “had” to see. Thankfully, time went by and I broadened my perspective, which taught me to look at the Eternal City from afar. Rome is known as the eternal city and for all the right reasons. It has some of the most amazingly preserved ruins around the world. It seems that along every street is another ruin. There’s so much to explore in Rome, I’m not sure if there’s ever truly a way to see it all. The SAI Programs home office is located in California’s Sonoma Wine Country, in a small town called Sebastopol. “Only an hour north of San Francisco, Sebastopol offers small town charm, farm-to-table organic food and wine, creative artists and healers, and easy access to the Laguna, the Russian River, Sonoma coast and Redwoods” boasts the Experience Sebastopol website. The SAI offices have been located in Sebastopol since 1995. SAI caught up with SAI Visa Director Rose Maier, who has provided some helpful tips on the student visa process. I have been the Visa Director at SAI for fourteen years and have seen and heard a million stories from students that have made me laugh and cry. Studying abroad has meant putting myself way outside of my comfort zone. I am quick to welcome challenges and believe that you grow the most when you choose to do something every day that scares you. I like to think I adapt to new situations with ease, but I have most definitely experienced my fair share of language and culture barriers. Last weekend the SAI Barcelona family traveled to Montserrat for the day. It is located west of Barcelona taking us an hour to arrive at the base of the mountain. The train to Montserrat leaves once every hour from Placa d’Espanya, therefore, it is important to be punctual! The sheer beauty of Montserrat left me wanting to come back and conquer the highest peak, Sant Jeroni (1,236 meters). We caught up with SAI Rome Assistant Program Coordinator Alessandra, who talks about a weekend in the Eternal City. Move to Rome in the summer, when the heat almost splits the sidewalks open. Move to Rome without knowing which buses, trams or metros to take. Move to Rome and be confronted with hoards of tourist every single day. I know, it’s not the most fun part of studying abroad, but it’s important that all students are well prepared for their experience, especially when it comes to safety. Use this quick guide to make sure you take the necessary steps to prepare! Before You Depart The best you can do to ensure a safe time abroad, is to prepare before you depart! Andrea, SAI Admissions Counselor took some time to offer some travel advice for students traveling or studying in Paris. The energy and excitement of the area was electric: a beehive of tourists and students strolled the boulevards, through the Latin Quarter, and along the Seine. It was a warm April evening, and the center of Paris was buzzing. These photos highlight SAI’s excursion to Abruzzo from September 14th to the 16th. This was by far my favorite trip I’ve taken so far–who wouldn’t love horseback riding, eating on the ocean, and taking a self-guided tour through a castle in the mountains? The region of Abruzzo certainly is a hidden gem, with its gorgeous scenery, unforgettable food, and charming historical towns. Each semester, SAI carefully selects a group of student bloggers. These students are to write about their experiences abroad by producing blogs and contributing to our social media. Below is the list of our Spring 2019 student bloggers. You can check out their blog posts throughout their time abroad. Aileen Hernandez, Florence Home school: Colorado State University 1. I am a proud First Generation Student 2. It’s so god-like; the way the sun creeps through the details in the gates, the architecture, and the ceilings of various basilicas and cathedrals. The crows sincerely flock amongst the highest pillars, statues, and apartment complexes. Flowers cover terraces and rooftops, as if everyone had a garden. Everything created here seems inspiring enough. Romans cared, and still do, about glorious, gigantic creations. We handed over our Instagram account for the day to SAI Paris student Jordan. Jordan gives us a glimpse of a typical day in Paris. Bonjour! Je m’appelle Jordan! (@heyyjdawg) I am from Colorado, but am currently a Junior at Baylor University studying marketing. This fall I am studying abroad at the American University of Paris! And what’s a trip to Paris without a visit to the Eiffel Tower?! SAI Milan Program Coordinator Laurence is contributing to our blog this month. Laurence shares some wise advice for students considering studying abroad. New students must be slightly nervous about meeting their housemates for the semester. Multiply that by the whole group and you have my Program Coordinator semester nerves in a nutshell! “Never let the fear of striking out keep you from playing the game” -Babe Ruth This past weekend, SAI Ambassador Danielle worked at her school’s Fall Open House through the study abroad department and had the chance to speak with potential students to share her experiences as a student abroad and answer some of their questions and sooth their doubts. So here is her take of some of the most common questions she got. Food When talking to friends and family about my decision to fly across the pond and study in Spain, the Mediterranean diet continued to surface. “Lots of fish and even more olive oil!” I kept on hearing constantly. Nobody lied about the consumption of olive oil. To put it in perspective on average Americans consume 1.1 liters of olive oil every year but Spaniards, a voluminous 10 liters. On a spur of the moment decision, a roommate and I decided to go to the Amalfi Coast for a weekend getaway. We decided to go to Positano, and it was one of the best decisions we made. The views were absolutely breathtaking, the water was the clearest I’ve ever seen, and it became one of my favorite Italian trips. The whole time I was there, I couldn’t stop staring at my surroundings thinking, “I must be in a dream. I’ve been working with SAI students and their cell phone options abroad for over 14 years now and I can officially say it hasn’t gotten any easier over the years! With Europe finally getting rid of some roaming charge issues, things are getting better, however, there still is the difficulty with connectivity and the different band frequencies that are used in the U.S. versus abroad. This month Edna Wilson, Vice President of Academic Affairs, is contributing to our blog. Here, Edna provides some tips on learning about entrepreneurship during your semester abroad. SAI partner schools offer a wide range of learning opportunities in one of the fastest growing educational areas by giving students access to entrepreneurs and internships with a focus on entrepreneurship. SAI caught up with SAI Ambassador Morgan, who answers some questions about her time touring Italy while studying in Rome. What surprised you most about your study abroad city/culture? Something that surprised me most about Rome was how small it felt even though it is the largest city in Italy with a population of over two million. We caught up with SAI Senior Admissions Counselor Jamie, who provides some input on how to best choose a study abroad destination. You’ve heard all the amazing stories from friends and family of their epic study abroad experiences. We caught up with SAI Paris Program Coordinator Jenn, who is contributing to our blog this month. Jenn is highlighting one of the SAI-included weekend excursions. One of the SAI Paris Excursion destinations is the Medieval town of Annecy. Located about 30 mins south of Geneva and 90 mins east of Lyon, Annecy is in Southwest France not far from the Swiss border. We caught up with SAI Ambassador Brianna, who took some time to answer questions about her summer in Sorrento. What does your study abroad experience mean to you? Studying abroad was something that I had always dreamed of doing, so when it finally happened I couldn’t even believe it. I have always had a passion for traveling and experiencing the world and the variety of cultures it has to offer. Paris, as you may know, is perhaps the perfect city for one of my favorite pastimes: People-watching. The (literal) thousands of cafes, with outdoor tables facing the city streets, make it all too easy to stare at strangers as they stroll to and fro. Within these first two weeks of my Paris adventure, I have invented a game to make people-watching all the more amusing, which I call: “Spot the Tourist. One of the many perks of going through SAI are their included excursions and trips, which you must take advantage of. So far, we’ve had a welcome day, which included wine tasting and a tour of Frascati, a food tour, and a weekend excursion to Abruzzo. The weekend excursion to Abruzzo is an absolute must. We caught up with SAI Ambassador Molly, who answered some questions about her summer in Barcelona. How has studying abroad impacted your life goals? I have always known I’ve wanted to travel as much as possible in life. I chose my major based on what would allow me to travel. I chose my university based on who would let me travel as much as possible. Check out SAI Barcelona’s new reporter’s introduction to his blog and his first recommendation: Street Markets With Live Music. The Plaza de Toros Monumental de Barcelona, more commonly known as La Monumental is a fascinating bullfighting ring located in the Eixample district. Having a capacity of 19,582 this venue has been graced with concerts from the revolutionary Beatles and the legendary Rolling Stones. SAI caught up with Ambassador Amanda, who answered some questions about her time in Rome. My advice for new study abroad students: Start a journal and keep up with it. Take lots of pictures but don’t let that distract you from the moment. Of course, take lots of trips but don’t forget to spend lots of time exploring the city that you are in. We caught up with SAI Ambassador Victoria, who answers some questions about her time in Barcelona. Favorite week abroad My second week abroad in Barcelona had to be my favorite week out of the six. We caught up with SAI Ambassador Andrew, who answers some questions regarding his semester in Barcelona. What was your favorite class abroad and why? I loved all my classes that I took in Barcelona. One of the Spanish culture courses that I took was called “Seven Wonders of Spain.” This amazing class featured professor-led tours throughout different neighborhoods in Barcelona. SAI Ambassador Zhenan answered some questions about his summer in Milan. Read what he has to say: What is your favorite memory from studying abroad? My favorite memory is the memory with my friends. We met with each other during the abroad program. We were all from different countries. We caught up with SAI Ambassador Kirsten, who took some time to answer questions about her time in Rome. What did you learn about yourself when you were abroad? How have you changed? I have always thought of myself as a shy and reserved person and did not like to branch out much. We caught up with Ambassador Krystal, who spent some time answering questions about her time in Rome. What felt the most “foreign” to you when you came back to the US? Coming back was strange to me but what felt the most completely different was being able to talk to my family in one room. SAI caught up with Grace, who reflects on her semester in Milan. What does your study abroad experience mean to you? At first, study abroad was just a way for me to travel more. It was always an expectation of mine as my sister studied and lived abroad and my mom left Ireland when she was 18 to travel the world and found a new home in America. We caught up with former SAI Rome student McKenna, who is now an Ambassador. McKenna reflects on her semester abroad. What was your favorite thing to do in your host city? I have many favorite things to do in Rome, but I will narrow it down into two categories: a favorite food and a favorite place. We caught up with SAI Ambassador Christian, who reflects on his time in Rome. What was your favorite class abroad and why? My on-site urban sociology class was definitely my favorite because we met, mostly, in Rome instead of in the classroom. The professor for this class was Roman, so we learned some fascinating information about the city and saw spots in the city we might not have known about. We caught up with SAI Ambassador Marybeth, who reflects on her time in London. What was your favorite thing to do in your host city? There are so many things I love to do in London, and there is always something to do in the big city. Generally, I really just enjoyed going out and exploring all of the different districts and areas throughout the city. SAI caught up with Ambassador Lisa, who looks back at her spring in the Eternal City. What is your favorite memory from studying abroad? It snowed for the first time in six years in Rome, so my friends and I spent hours walking around enjoying the locals’ reactions to the strange weather. Seeing the Trevi Fountain covered in snow was a rare sight. We caught up with SAI Ambassador Lorraine, who answers some questions about her time in Rome. What travel tips would you give someone studying abroad? One major travel tip I would recommend to people who are going to study abroad is to make sure that you get to travel to a bunch of different places during the semester, but also make time to get to know the new home you are in. SAI recently caught up with SAI Ambassador Alexis, who took some time to answer questions about her time in Rome. What is your favorite memory from studying abroad? My favorite memory from my time abroad is an odd one. It was my first trip outside my host city, Rome, with three of my roommates from my program (who are now my best friends) and we went to Venice for the annual carnival. We caught up with SAI Ambassador Bailey, who took a moment to reflect on his time in Rome. Q. How has studying abroad impacted your life goals? A. Studying abroad has taught me to always just try and do what I want. If there was a city I wanted to go to, I would go. If there was a food I wanted to try, I would try it. SAI caught up with SAI Ambassador Kajal, who took the time to answer some questions about her memorable semester in Rome. What does your study abroad experience mean to you? My study abroad experience was absolutely life-changing in the best ways possible. I learned so much in that one semester alone outside of a classroom than my entire college experience has been able to give me. SAI recently caught up with SAI Ambassador Richelle, who helps paint a picture of her semester in Milan. What was your favorite class abroad and why? My favorite class while I was abroad was The Fashion Market. It combined my two passions: marketing and fashion! We recently caught up with SAI University Relations Associate, Clau, who shares some insider tips on the famous town of Venice. I absolutely love Venice. It is a unique city which, unfortunately, gets a bad reputation of ‘too crowded’ and ‘cruise line infested’. Known as “La Serenissima” (The Serene One), I always try to make my visits as relaxed and serene as possible and I love introducing people to this magnificent place. SAI recently caught up with SAI Ambassador Ashlynne, who answered some questions about her time in Barcelona. What did you learn about yourself when you were abroad? How have you changed? I think the biggest thing I learned about myself when I was abroad was the fact that I had the ability to be independent and that I was fully capable of doing things on my own, even traveling. SAI recently caught up with SAI alumna Misha Maier, who completed her Masters degree abroad, to ask her about her experience abroad and her life now. Where and when did you study abroad? From 2009 to 2010 I attended the Masters in Interior Design and Living program at Domus Academy in Milan, Italy. Was there a class that you took abroad that really stood out from the others? SAI recently caught up with SAI Ambassador Lindsey, who answers some questions about her semester in Barcelona. What was your favorite thing to do in your host city? My favorite thing to do in Barcelona was to just walk around as much as I could to discover new places. After class, I would run home to drop my things and then hop on the metro. We recently caught up with SAI Ambassador Sabrina, who answers some short follow-up questions from her time in Barcelona. What was your favorite class abroad and why? My favorite class abroad was the Political Economy of European Integration. Whether this is your first time abroad or you’re an expert globetrotter, it’s always helpful to have a list of items you may want to pack – you know, a comprehensive travel checklist! Save this post because you’ll want to refer back to it as your trip approaches. Step 1: What Luggage to Bring Whatever your destination, you’ll want luggage that is lightweight and big enough to hold all of your essentials. My Rome Away From Home! Hi all! My name is Kate and I spent my whole sophomore year abroad with SAI in Rome, Italy. It was one of the best experiences of my life and I can’t wait to go back. I’ve answered some of the questions I have gotten asked a lot! What is your favorite memory from studying abroad? It’s hard to choose just one memory out of my year abroad! We recently caught up with SAI Ambassador Dana, who took some time to answer questions about her semester in Rome. What did you learn about yourself when you were abroad? How have you changed? Being abroad has definitely changed me for the better. However, I did have anxious beginnings. We recently caught up with SAI Ambassador Antonio. Antonio answers some questions describing his recent semester in Rome. What is your favorite memory from studying abroad? My favorite memory from studying abroad in Rome would have to be all the group dinners my friends would have every week. We discovered so many different “hole in the wall” places and had some of our best memories together over dinner. A Look Into My Time Abroad! SAI recently caught up with SAI Ambassador Ellie, who reflected on her memories in Barcelona. What surprised you most about your study abroad city/culture? My first week in Barcelona I went to a Barcelona futbol game. I had no idea how passionate and crazy these games were. I was shocked. I have been to NFL games before, Seattle Seahawks, and those games are crazy loud. I didn’t imagine a game like this would even compare. Each semester, SAI carefully selects a group of student bloggers. These students are to write about their experiences abroad by producing blogs and contributing to our social media. Below is the list of our Spring 2019 student bloggers. You can check out their blog posts throughout their time abroad. Jordan Benda, Paris Home school: Baylor University Rock climbing/bouldering and snow boarding are some of my favorite ways to stay active. The Best of SAI: Choosing a Host City For YOU! Camille is an SAI Ambassador who was selected to intern at SAI’s headquarters in Sonoma County, California for the summer. Ciao everyone! So it looks like you’re interested in studying abroad! Of course you are! Let me guess, you’ve read some articles, talked to your school about realistic options for your major, maybe stalked your friends photos from their study abroad experience…You’re starting to get overwhelmed with options. So now what? At John Cabot University in Rome, students have the opportunity to gain real life experience with real life clients through their projects. Once the students complete the project, they present them and one is selected and used by the client. One of our students, Sam Gleason, took an Advanced Graphic Design course with professor, Sabrina Schmidt, and her designs were chosen for the rebranding of Joanne Bergamin’s blog, TravelAngel. The Eternal City and the Capital of the World, Rome boasts some of the greatest art and structures from the old world. You will find the Colosseum, the Pantheon, Vatican City, and countless other treasures. If you see any of these attractions, you are standing where ancient Romans once stood; through observation, you are experiencing the legacy of thousands of years that is Rome. We recently caught up with SAI Custom Programs Coordinator Marco. Marco shares his experience on a spring weekend trip with Muhlenburg College. As Custom Programs Coordinator at SAI I come in contact with several groups of students all over the year. The most exciting part of my job is when, after months of planning, a group arrives and I get to meet and greet the students on site. Hey there, I’m Camille. I’m the SAI summer intern at the headquarters in Northern California. I was born and raised in Philadelphia (cue Fresh Prince theme song) and recently graduated from Muhlenberg College, where I studied Acting and Fine Arts, and worked as a barista. So… if the rumors are true about interns just doing coffee runs, I’ve got it covered. Rome is the perfect European capital where art, history, and religion are ​significant and contribute to Rome’s uniqueness. ​As a fashion lover and someone who enjoys eating foods that are difficult to pronounce, Rome was the perfect place to gain valuable knowledge and experience new adventures. Here were some of the iconic landmarks I visited so far and the yummy food I got along the way. We caught up with SAI Florence Housing Coordinator & Assistant Program Coordinator Christy, who is contributing to our blog this month. Christy retells some of the unique parts of living in Italy. When I first landed in Italy from the US, I was in awe and also a little bit surprised. I was in awe of the beauty, the sound of the Italian language and the food was absolutely amazing! The Adventures of Interning in a Foreign Country When you Don’t Speak the Language **Hint: the secret is patience, positivity, and a lot of hand signals** Ciao! My name is Charlee Wilkerson and I’m a rising senior at the University of South Carolina. I’m a Retailing major with an emphasis in Fashion Merchandising and I chose to spend the summer in Sorrento, Italy interning at a boutique called Acanfora. We recently caught up with SAI Senior University Relations Manager Sarah Langston. Sarah shares some reasons to consider SAI Programs for your study abroad experience. As a former study abroad advisor, I know that it can be challenging to help students differentiate between various programs. During my time here in Sicily, I’ve had my fair share of time to explore the city and experience new things. In deciding to come here, I believed that Italy would have many similarities to my home in New York, but over the past two weeks, one thing I have noticed is that there are actually quite a few differences between my tiny suburban town of Rhinebeck, NY and this condensed city of Siracusa. We caught up with SAI Milan Program Coordinator Laurence, who is contributing to our blog this month. Laurence is including some must-do’s for those first few days in your host city. Here are 10 alternative things to do during your first week in your new study abroad city: 1) Get the boring stuff done “Oh god! If this is number 1, I’d hate to see number 10. Prior to finalizing my decisions to study abroad I always knew that I wanted to stay with a host family to get the full experience of cultural immersion. I wanted to live in a house where they could help teach me the language, feed me authentic food and be a part of their everyday lives. It has been a year since my time abroad and I have been itching to get that experience again. It’s the itch my body feels for adventure, change, and new experiences. It’s not necessarily studying abroad that I’m craving, but just traveling to different countries in general. I have officially diagnosed myself with the travel bug, and this guy is worse than the flu. While studying abroad in Paris this semester, I learned 14 things. Here they are: 1) Be as much of a tourist as you can in whatever city you are in, abroad or at home. It is so important to soak up all that a city has to offer and to experience the “must-do’s”- they’re must do’s for a reason! 2) But, know when to live like a local. I have met some incredible individuals this semester. Europeans, short and tall, have welcomed me with open arms throughout my four months abroad and the kindness is truly contagious. The range of people has gone from playful children next to me on a canal cruise in Amsterdam, to a wise old woman helping me with the London tube. We caught up with SAI Rome Custom Programs Coordinator Jordan, who is contributing to our blog this month. Jordan talks about his recent experience joining a Faculty-Led Program in Milan. One of my favorite parts of my job is getting to travel around Europe with our Custom and Faculty-led Programs, learn new things and meet great people along the way. As my program is sadly coming to an end, I have been reflecting on some of the ways I want to spend my last days in Rome. And I thought to myself, “What other way to spend my last few days in Rome than by eating the great-quality food than I cannot find at home!” Here are some of the ways I have been spending my last few days in Rome. 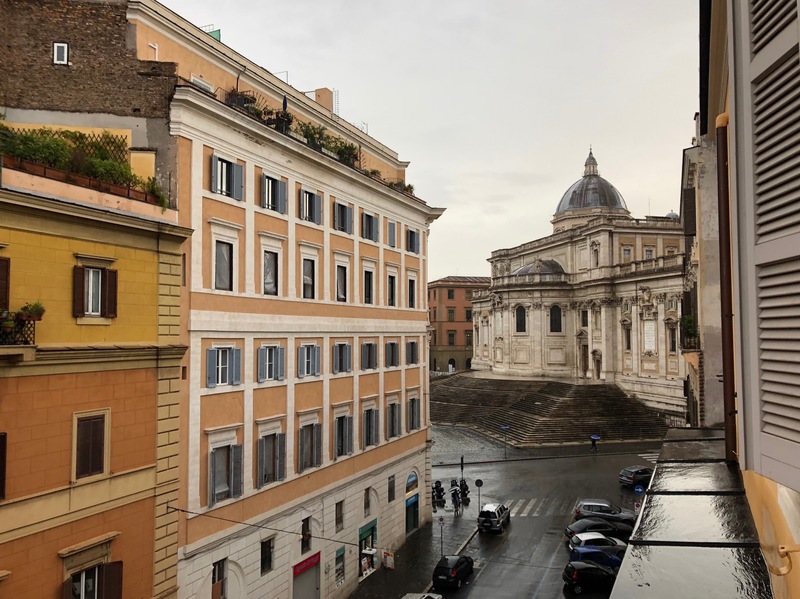 We asked Sam, SAI Rome student, to show us what a day in her Roman life was like on our Instagram account. This is her day in Rome. Ciao! I’m Sam, a junior at Penn State currently studying at John Cabot University in Rome. I’m taking over SAI’s account today to show you my typical day in the Eternal City. Each semester, SAI carefully selects a group of student bloggers. These students are to write about their experiences abroad by producing blogs and contributing to our social media. Below is the list of our Spring 2019 student bloggers. You can check out their blog posts throughout their time abroad. Brayden Aime, Rome Home school: Gap year student 1. I have played basketball for 5 years. Last summer when I studied abroad in Rome, I got the chance not only to see, but to eat my way through some of the best cities in the world – not just in Italy but all over Europe! I traveled all around Italy, then up to London, Ireland, Scotland, Spain and France.. It was the ultimate summer filled with the most amazing experiences. There is a common perception about studying abroad that views the semester as a prolonged vacation. People believe that students spend all of their weekends traveling to the major European capitals, such as Paris or London, but this only allows two days for scrambling around the city and fitting in only the most cliché of tourist sights. Congratulations to Brigid Deegan for winning the SAI Spring 2018 Photo Contest! Brigid is studying abroad with SAI in Siena from Muhlenberg College, and she submitted this stunning photo taken in Verona, Italy! Brigid’s photo received the most votes and she has been awarded a $100 Amazon gift card.To view all the photos please see the Facebook album. If you asked me before I went abroad what a kebab was, I would think of the skewer stacked with roasted meats and vegetables. In Europe, “kebab” has a completely different meaning. Döner kebab is an incredibly popular dish made up of seasoned meat that is shaved from a vertical rotisserie and topped with fresh vegetables and sauces. Döner is similar to the Arab shawarma and Greek gyro and is famous for its late-night accessibility. We caught up with SAI Barcelona Program Coordinator Leticia, who is contributing to our blog this month. Leticia recounts her weekend student excursion to the sunny, southern town of Seville. I have lived in Andalusia for a few years and I have explored Spain’s southern region several times. I will be discussing a day excursion I went on through SAI to San Gimignano. It is a small hilltop city in Siena, Tuscany surrounded by ancient walls and known for its medieval towers. When I walked through on of the gates leading into the city, I could feel the history in the walls as our tour guide walked us down the street towards the Piazza della Cisterna. The last year of high school, I remember my government professor sat the entire class down and read to us, “Oh, the Places You’ll Go.” Who would have thought that three years later, I would be traveling through Europe, discovering the different cultures and familiarizing myself with local traditions? Being able to explore other people’s customs has been a blessing that never seemed real until I found out about SAI and John Cabot University. Are you looking to study abroad this summer without shelling out too much money? We have you covered! Check out 5 Summer 2018 programs that will cost you under $5,000, below. Barcelona: Universitat Autonoma de Barcelona (UAB) – Summer 4 weeks (3 credits) – $3,950 UAB offers an intensive 4 week Spanish language summer program through its renowned language school, UAB Idiomes. My name is Lauren and I am a senior at St. Mary’s College of California. I was a study abroad student in Rome, Italy my senior fall semester of 2017. My experience with SAI and being abroad was unforgettable. The memories I made, the people I met, the food I ate, the places I traveled… it was four months of being in constant awe of where I was and what I was doing. I remember my first solo overseas trip as if it were yesterday. I had spent a year planning, working, saving money, and preparing myself for what I was certain would be the experience of a lifetime. SAI Programs Admissions Counselor Andrea Moran provides an in-depth look at how to transport your medicine on your study abroad adventure. “Nooooo…not another pre-departure detail!” you might be thinking. I totally get it. You already have a ton on your mind as you prepare to study abroad. Luckily, preparing to take medicine abroad normally doesn’t require epic amounts of paperwork, but only good judgment and some preparation. It feels like just yesterday I was trying to figure out how to buy a metro pass, and now I know most of the subway lines throughout the city like the back of my hand. The fact that I am already halfway through the semester baffles me, and I know that the second half will go by even faster than the first. We caught up with SAI Rome Assistant Program Coordinator Arianna, who is contributing to our blog this month. In her entry, Arianna describes a recent SAI excursion to the beautiful Abruzzo region of Italy. In September 2017, SAI Rome took over 50 American university students on an inaugural weekend excursion throughout the region of Abruzzo. We handed over our Instagram account to Alex for the day. This is her day in Paris. Hi everyone! My name is Alex Lehnhard and I am a Junior at the University of Alabama, studying accounting and finance. This semester, I am studying abroad in Paris at the Paris School of Business. I’ll be taking over the SAI Instagram today to show you what it is like to be a student in the city of lights! This is my list of the five best places to eat at in Rome: Suppli In Rome, what you are looking for are diamonds in the rough. This place I tried on the Roman Food Tour, an event sponsored by SAI. We went around the neighborhood and tried different foods. This place named Suppli has become my favorite place to eat something quick in Rome. Hi guys! My name is Nicole and I was a student with SAI in the Spring of 2016! I studied in London and fell in love with Europe as a whole. I now work for SAI doing Digital Marketing and Social Media and I LOVE it! I am headed to Europe with only a carry on and a backpack to go under my seat! It’s really not that bad! “I’m in the middle of finals.” “I’m too busy with school and work to fill out the application.” “I don’t want to write another essay about myself!” As SAI’s Admissions Counselor I get my fair share of students wanting to forgo the application process and head straight for acceptance into one of SAI’s programs. And I can’t blame you. However, rest assured the SAI application process is not that bad! When people say, “time flies when you’re having fun,” they weren’t kidding. I have been in Rome almost one month and it still feels like a brand-new place. Everywhere I turn I “accidentally” stumble upon something incredible. Last week, we were walking to dinner one night and we turned the corner and oops, there was the Trevi Fountain. That’s so casual, right? Shoot took a wrong turn—wait that’s the Colosseum. When coming to a new country, there are things that stick out to you right away. One of them happened to be the beautiful and historic buildings that surround me everywhere I go. I had imagined what Rome would be like, but I didn’t realize that wherever you go, there is a story of each old beauty you pass. Moving to a new place always holds a seed of terror. Even if it is only to the neighborhood next door, each place holds its own culture that you might not be sure if you fit into. While going abroad, this worry about fitting in and unpleasantly standing out is especially prominent. For my study abroad experience I decided to go to London, so I had no language barrier for all intents and purposes. I had never been to Spain before studying abroad and I wanted to immediately immerse myself in the unique culture. Within my first week in Barcelona, I took a Spanish cooking class! The class was organized through SAI and held at a modern kitchen just a few steps away from the Barcelona City Hall, in the Gothic Quarter. We caught up with SAI Rome Program Coordinator Brie, who is contributing to our blog this month. Here, Brie includes some wonderful tips on how to make use of those unused passport pages post-study abroad. Ciao! Wow, is it nice to only have classes two days a week! This semester I only have classes on Monday and Wednesdays from 8:30-3:45 and it might be the greatest decision I’ve ever made. Yes, I have to wake up pretty early for my classes, but the feeling at 4pm on Wednesdays afternoon makes it all worth it. Imagine this—having a four-day weekend EVERY WEEK! Well guess what? The Highs and Lows of Traveling While Abroad! One of the main things I’ve heard from others studying abroad is how easy and affordable it is to travel Europe. I think this is true to some extent but, as we’re approaching the end of the semester, my group has decided that it is okay to take a weekend off in-between trips! We’ve seen some truly, incredibly breathtaking places, but our bodies are constantly telling us to slow down. When I decided to study abroad in Rome, I knew I wanted to learn about the expansive history of the city and spend as much time as possible exploring ancient ruins. To my surprise I found exactly what I was looking for: a history of ancient Rome class offered by John Cabot University. We caught up with SAI Florence Program Director Regan, who is contributing to our blog this month. Regan is including her on-the-ground insight on volunteering while studying abroad in Florence. You arrive in a new country, new city, new culture, new school, new people … new everything! How do you get involved in your new community and enrich your already dense experience of studying abroad?